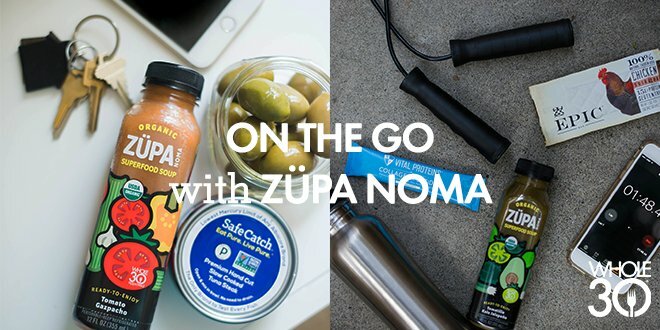 Around Whole30 HQ, ZÜPA NOMA soups are a favorite Whole30 on-the-go option. We like sipping on them during brainstorming sessions and packing them in the cooler for road trips. 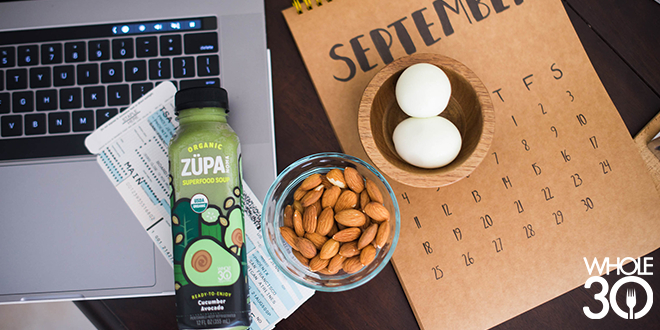 One of our favorite Whole30 on-the-go strategies is to build mini-meals around our favorite ZÜPA NOMA flavors. Take one of these 100% organic veggie soups, add some protein or a little healthy fat (or both! ), and you’ve got a satisfying and refreshing emergency meal, no matter what unexpected situation you find yourself in. SPECIAL OFFER! 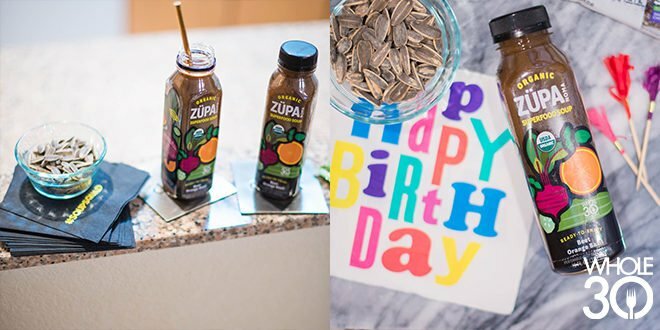 Subscribe to ZÜPA NOMA’S Whole30 Sampler, save 10%, and receive their two NEW limited edition seasonal flavors FREE with your first shipment. Use the code SEPTW30 at checkout. Cucumber Avocado ZÜPA NOMA + almonds + hard boiled eggs = a pretty darn good hotel room breakfast. If you’re on the road for work a lot, you know that Whole30 breakfasts can be challenging for a variety of reasons. If you’re stashing a ZÜPA NOMA Whole30 Sampler in your hotel room mini-fridge, you can make things a lot easier on yourself at breakfast time. Bonus tip: ZÜPA NOMA will ship your soups straight to your hotel, so they’re there when you check in. That way, you don’t have to worry about stashing a soft cooler and ice packs in your suitcase. Call your hotel ahead of time to make sure there’s a mini-fridge in your room; they’ll provide one for you if it’s not automatically included. 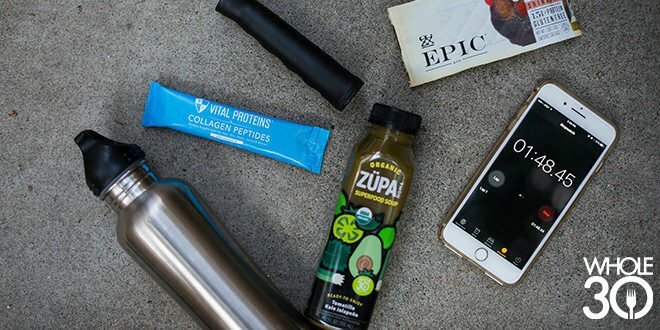 Heading from the office to the gym to book club? Tomatillo Kale Jalapeno ZÜPA NOMA + a Chicken Sriracha EPIC bar are a zesty combo to keep the hangry at bay until you arrive home to a proper dinner. Bonus tip: Mix Vital Proteins Collagen Peptides into your soup for a boost of collagen and extra protein. Just dump the easy-to-mix, flavorless peptides into your bottle of soup; cap it; shake it; and enjoy. You’ve got a busy morning running from here to there… and there’s traffic. Or your kid texts you last-minute about a forgotten parent meeting. Or you realize this tire balance and rotation is going to take way longer than you thought. 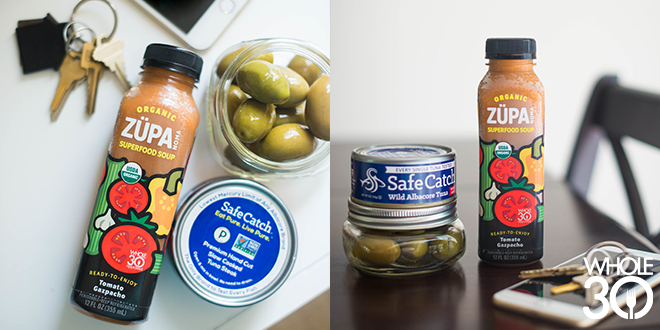 Make a habit of packing up a Whole30 mini-meal; this trio of Tomato Gazpacho ZÜPA NOMA, Safe Catch tuna, and Whole30 compliant olives has a Spanish flare that we love. Bonus Tip: BYO ZÜPA NOMA Tomato Gazpacho to your family brunch and make your own virgin Bloody Mary, complete with olives on a stick. Delicious and festive without the brain fog! Want to build your own Whole30 mini-meals with ZÜPA NOMA soups? 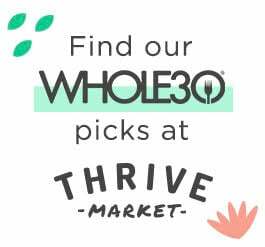 Take advantage of this special #SeptemberWhole30 offer by subscribing to their Whole30 Sampler. You’ll save 10% and receive their two new seasonal flavors (Pumpkin Cinnamon Sage and Cauliflower Cashew) for FREE with your first shipment. Just use the code SEPTW30 at checkout. This post was sponsored by ZÜPA NOMA.  This post contains affiliate links, meaning we make a small commission on purchases made via the links above. 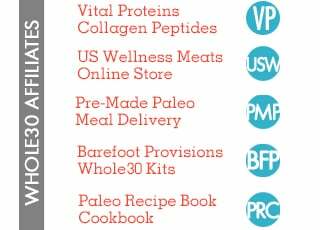 Thank you for supporting our Whole30 partners.